Hello, and welcome to my final article in this series on the Bardic Arts in the SCA. Over the past year, we’ve talked about SCA performers and what makes a good one, the types of music one can encounter within the SCA, what a contrafait or “filk” is and isn’t, the modes of music that flourished throughout the Middle Ages and Renaissance in the church, known as Plainchant modes, and the other types of music we can reasonably postulate may have existed, even if we have varying amounts of proof that they did. My topics for this final essay address the act of composition, the premise or perception that original music is in any way less desirable within the SCA than “authentic” music, and the idea that the Arts and Sciences authenticity standards by which bardic arts are judged have become disjointed from the authenticity standards of composition and performance that many bards are attempting to practice. One of the frequent criticisms faced by bards within the greater Arts & Sciences community is that when a bard writes something original, by definition it is not a period piece. Regardless of how “close” it may sound in style or lyric structure, it was written in the 20th or 21st century, not the 14th. No matter how closely the composer observes the “rules” of Renaissance composition, or crafts lyrics that show no obvious signs of modernity, it cannot be an extant, first-degree Medieval or Renaissance piece. Over the fifty-year history of the Society, a lot of time, trouble, and tearing of hair has been expended by musicians who attempt to get as close to period as possible. Those who do not attempt it, or who are more comfortable with more modern structures, are frequently called out for writing them, and told that the work they produce does not rate high on the authenticity scale because it doesn’t match up to those rules. Those who write contrafait using post-period music are often put in an even worse position. There are two separate but related suppositions within that line of reasoning that I reject. The first is the idea that there is only one “rule” for writing music that “sounds” sufficiently Medieval. As I theorized in my previous article about Medieval “folk music,” this is similar to the history in the College of Heralds, where for a long time, Fox-Davies was the only test of whether heraldry was “period.” In the same way, the test that many people use to whether music sounds period boils down to a very narrow spectrum. There’s more to period music than western European, liturgical, and court forms. We really have no way to know just how much popular music out there sounded somewhat similar to many a piece written within the acoustic / historical folk genre today. While many did correspond to the “rules,” there are also examples of pieces that did not. It may never be possible to sort out a definitive proportion, meaning that the debate can’t be resolved for sure. Thus, the “rules” school of thinking locks in the opinion that Western European church or court music is the only acceptable sound for a period-approaching piece, when clearly there are other influences and culturally accessible sounds which can readily be used as the inspiration for new music. The second flaw in the logical argument is that even Medieval music was new, back when it was first composed. Court and church composers were constantly evolving and expanding their understanding of musical mechanics, and consequently they were constantly trying new things, experimenting with and introducing different “sounds,” modes, rhythms, and melodic structures. It was not until decades later that these “rules” were codified. Scholars today often refer to pieces extant from period that signal tonal shifts in the development of music, “revolutions” that represent precious examples of changing practice. However, it is important to remember that as with other arts and sciences, a “revolution” did not necessarily mean a sudden sea change. In addition, the number of extant samples of music is likely a fraction of what was being performed, sung, heard and written within the scope of our period. Bear in mind that some combination of chance and circumstance is vital to the preservation of most of the pieces we have. If only one example of a particularly exciting and different sort of piece survives, that may mean that it was completely unique for its time and that no one else ever composed to that model–or it may mean that it was part of a fad, or that it was merely the lucky winner of the preservation lottery because it was a “best” example or the “first” of its kind. Even if it is the only one of its type, it’s still acceptable for a modern artist to emulate the style, or to use it to inspire something else similar. The reason these fallacies are important to expose is that they form pervasive standards against which the bardic arts are held. What is perplexing is that those standards are not applied in the same manner to other arts. We do expect cooks to redact recipes from period sources, but we also acknowledge that there are certain dishes which must be modified or updated in order to appeal to a modern feast-going audience. We do not expect them, however, to work with foodstuffs that we know will be unpalatable. We do expect clothiers to work from paintings, patterns, or extant examples of period styles of clothing, but we acknowledge that there are multiple garments for various classes, cultures, occasions, and climates. We expect them to choose natural fibers, but we would not actually expect them to work with 500-year-old cloth – nor would we expect them to use silk brocade to construct a working peasant’s garb. So why should we expect bards to work exclusively with 400-year-old or older music – and highly specialized music at that? Bards were many things throughout the history and cultures that the SCA encompasses. They were singers, they were composers, they were instrumental musicians. They were storytellers and poets, whose job was not only to remember and recite the old stories, but to commemorate current events by immortalizing people, places, and occurrences. They were observers of nature and interpreters of the natural world. They could be lorekeepers, but also lawkeepers, and they were frequently privileged to speak truth with varying levels of protection from retaliation by members of higher rank or station. They settled disputes, they entertained courts and crowds, and they advocated for the social covenants that governed the communities they served. And not insignificantly, they performed their own work and the works of contemporaries in addition to the repertoire of those who came before. Note, not all cultures’ bards were all of these things, and not all bards within all cultures fulfilled all these capacities, but I think it’s fair to stipulate that SCA bards often present a conglomeration of those roles in their contribution to the SCA. Yet too frequently, they are not judged as embodiments of this particular art, but heavily judged on their material. In other words, there are period versions of a lot of different types of bards, and crafting one’s art to fit into one (or more) of those models is, in itself, an act of artistic accomplishment and worth consideration as its own separate category. Does this mean they have no responsibility to “be medieval”? No, not at all. Bards must still be judged by and held to the same standards as other arts within the SCA–namely, that we must make “an attempt” to be authentic, and that authenticity is one of many components within the spectrum of accomplishment that make up the whole sum of a given artist’s skill and facility with their chosen form. But court and church rules are not the sole measuring stick of “medievalness”—nor do they necessarily provide a comprehensive definition of what is or was authentic. The act of transforming our exploits into tales of glory heightens those feats and puts them on a spectrum with historical tales (such as the Song of Roland), with legends (such as Arthurian mythology), and with historical political commentary and editorializing (such as the long tradition of Scottish protest songs, many of which date to period or just-post period). Songs like “Bow to the Crown” immortalize our traditions and more importantly teach why those traditions exist. Retelling the legends, myths, and historical incidents in new ways keeps them fresh, alive, and relevant. Pieces that capture moments, observations, and feelings, rather than relate a specific narrative, also represent a period practice. More importantly, they provide a point of view which is informed by the experiences of individuals in the SCA–frequently as a direct result of some activity that they pursue or some event they witnessed. All of these compositions remind both the new member and the SCA veteran what is appealing about participating in the SCA, what ideals to uphold and for which to strive, and what might have drawn us to the Society in the first place. The audience must be able to hear and understand the performance. These guidelines govern the composition of a piece, as well. Thus, for the SCA bard who composes, the singular most important consideration is whether they are capturing the spirit of the incident, feeling, mood, or person they are writing about. The form they choose, whether it’s a story, a poem, a ballad or a drinking song, should be considered analogous to the fabric a seamstress might choose for a given garment. It should be able to successfully execute the second principle, which is to carry the listener to the emotional state desired. Or, to put it the way Stephen Sondheim does: Content dictates Form. If the use of a period tune or format interferes with the composer’s ability to create a piece that will carry the audience to the desired emotional space, then the problem could either be that the composer’s not ready to write that piece, or that it could be the wrong tune or format to use for that particular project. If using a period form will have audiences concentrating more on the form itself, and less on the content, then they are failing to pay attention and thus may not understand the piece. If the composer’s grasp of the form is insufficient, then the product will be inferior, and again, it should not be used until the composer can do a credible job. The author is fighting the form, in these cases, and thus the result will feel forced or insincere. That’s not to say no one should ever stretch or set an ambitious goal; merely that it takes practice and dedication, and sometimes the moment requires a solution with more expediency. There are, of course, times when the performer does not want to call attention to the performance. Playing ambient music, or providing background entertainment during a party or vigil or similar venue, it’s more important to set the mood than to grandstand. But, I am speaking primarily of the type of bardic performance where it behooves the performer to put on a show. Finally, there’s another important and essential reason why it’s neither reasonable nor necessary for bards to tie themselves in knots writing exclusively “period” music: Writing music for use in the SCA is, in itself, a spectrum. Sometimes authors are writing pieces that have to bridge more than one type of audience, with different tolerance for more unfamiliar formats. Sometimes the melody that comes or the words that fit just don’t correspond to a particular Medieval mode of writing. Sometimes the attempt to force the form results in a song or poem that just isn’t any good, and needs to be discarded in favor of something that works better. When that happens to result in something that can’t be discretely documented, then the artist probably shouldn’t enter it into an A&S competition–but that does not, in my opinion, mean that the piece itself is automatically disqualified from being an “attempt” at period. Am I advocating a departure from period music? Absolutely not! Bards should certainly be familiar with period music and poetry! They should have period pieces in their repertoire, and I believe the more one learns, the more one finds to learn. And the more one listens to period forms, the more one’s own composition efforts will be able to imitate that sound. But, even if it never leads to more “period-sounding” music, I still submit that that is often a secondary goal. The primary goal for many bards is to be conversant in the canon of sung and spoken word pieces that apply to the milieu of the SCA. That means being able to come up with authentic period music on demand. But it also means that the canon of a well-versed bard should include the works of SCA virtuosos such as Leslie Fish, Heather Alexander, Joe Betancourt, Michael Longcor, Bob Charron, Heather Dale, Arthur McLean, Scott Vaughan, Ken and Lisa Theriot, and dozens and dozens more. These are the songs and poems of our own history, and their work has shaped who we are as a Society just as much as work from hundreds of years ago. With all that in mind, I propose that the debate about bards who write period material, or do not, is one in need of reframing. Bards are not necessarily Early Music scholars, nor should that be the requirement at any level of recognition. Bardic artists are not necessarily practitioners of period music composition, and nor should they be judged merely on that basis. They are practitioners of a different art – namely, the art of acquiring, learning, performing, teaching, and propagating all the types of music, poetry, and story that have been created to enhance the fabric of the Society, from period on up to today. Before I go on, let me just say: There are many highly accomplished bards in our midst who are *also* highly accomplished period scholars in a particular area, such as “Arthurian legend” or “Norse studies” or “Renaissance poetry” or “Celtic culture.” There are even bards who are *also* qualified Early Music Scholars! What I am talking about is a different aspect of their skill, one that emphasizes their knowledge about performing and choosing what to perform. Judging a bard on this basis, therefore, does not begin and end with the question of composition or authenticity. It should place emphasis on the skill with which they choose venue, select or create their pieces to suit that venue, pick their moments, and move their audiences through their selections. The question should concern itself with the depth and breadth of repertoire, including the ability to change gears, when needed, from period to SCA-original to a well-timed current reference. If they do compose music, and are to be judged on what they write, then the question of authenticity should apply as much to the construction of their music and lyrics as it does to the effect those compositions create. For example, if it’s a dance tune, does it fit the type of dance? If it’s a quiet mood piece, does it blend into the background while still creating a pleasant atmosphere? If it’s a show-stopper, does it live up to the expectation of the crowd? Writing in period styles need not be a prerequisite, but rather an additional, extra level of skill. But I Still Hate Filk! I hear you cry. Well…unfortunately, that’s a matter of taste, and potentially of appropriateness, not necessarily of whether the contrafait the bard performs is “authentic” because it’s not a period tune. To me, it’s a question of perspective–are we judging authentic practice, or authentic source material? In fact, one could argue that if one considers an expanded definition of “authentic” for the bardic arts, then the period practices of a skilled bard would support a newer song. A contrafait written to an obscure centuries-old tune, for example, might be considered a less authentic practice, because in period, a bard likely would have chosen a more popular or timely tune, one that everyone is already humming, on which to hang a modified lyric. Besides, as I said in my article on contrafait, it’s deceptively difficult to write a really good one – and when it’s really, really good, and it’s used effectively, then rarely is there objection. The important question about using a contrafait tune is the venue in which one plans to use it, and sensitivity to whether using it will break the wall of immersion for the other people within earshot. Obviously, the brighter the spotlight on the performer, the more important it is to be sensitive to the piece’s qualities (e.g., its humor/gravitas, its obscurity/recognizability, its timeliness or its importance, or even the way in which the original informs the adaptation). These factors govern what will make the moment, or mar it. If the venue is one that values documentable authenticity more highly than any other factor, then a modern contrafait is likely to bomb no matter how clever it is. If the singer is only singing for a very select group of people who love the genre of the original source material, then it’s likely to go reasonably well assuming it’s performed well. Ultimately, it all comes down to the performance, and the frame in which we as members of the Society choose to view the performing artist. Again, this is a delicate balance I am drawing, here, and it’s easy to be mistaken for excuses or arguing that we don’t need any standards of authenticity when it comes to the bardic arts. Nothing could be further from the case. We still subscribe to a conceit that we are recreating the Middle Ages, with the clothing, food, activities, and amenities that would have been available between 600 and 1600 CE. We are still striving to immerse ourselves in an enviroment that consciously sets aside the modern. Bards must and should be cognizant of that. In their performances, they should strive as well to reduce the intrusion of the modern onto the medieval. I don’t expect a modern contrafait to score high in an Arts and Sciences competition based on its source of melody, or to exempt bards from any attempt to remove obvious modern references that tax the listener’s willing suspension of disbelief. Bards who refuse to play the game are just as culpable in their offenses as other types of “bad bards” who do not respect their audience or the venues in which they perform. I do, however, believe that parts of the SCA have moved the needle, if you will, too far to the side of “period-and-nothing-but” whether inside or outside of A&S competition. Most particularly, I submit that what they perceive to mean “period” may be in need of adjustment and expansion, because it is often considered only within the narrowest of definitions. Those definitions have limits which are often too proscriptive when they are applied to the theory and practice of the bardic craft within the milieu of the SCA. Throughout the course of this series, I’ve tried to expose the reader to the state of the Bardic Arts. I’ve discussed how to listen, participate, and encourage bards to improve. I’ve provided definitions of types of music found in the SCA. 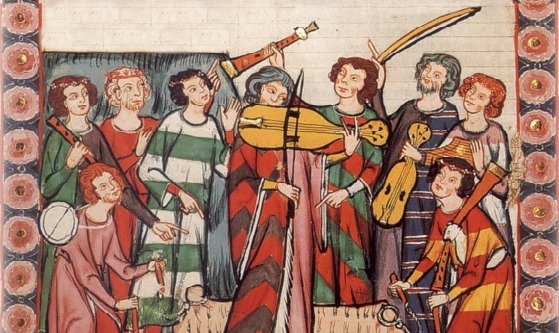 I’ve given a technical lesson on the sound of Medieval music and discussed why that sound is perhaps a very small percent of what music really sounded like. I hope that I’ve shed some light on the standards by which bards judge each other – and the standards by which I believe they should be judged. Thank you for reading along and for all the comments I’ve received from many of you. I hope this is not the end of the conversation! Please consider checking out the classes and symposium at Pennsic, attend a bardic circle (or just get some singing going at an event), and especially, find me or my fellow bards and let’s have fun! Before I sign off, I wish to thank Duke Titus and Countess Anna Leigh for having selected me as their Sylvan Bard during their reign. I offer my heartfelt congratulations and best wishes to Master William de Montegilt for succeeding me at 12th night last month. He knows the role of Kingdom Bard well and will, I am certain, continue to bring our Kingdom wordfame through his performances and his encouragement of other performers. It was my great honor and privilege to serve over the past year as Æthelmearc’s Champion for, and of, the Bardic Arts. Except in circumstances where it is impossible, impractical, or unattainable, for the intended purpose. In “Finishing the Hat,” Stephen Sondheim’s first volume of collected annotated lyrics (Knopf, 2010), he cites his three rules for lyric-writing: “1. Content dictates form; 2. Less is more; 3. God is in the details; all in the service of Clarity, without which, nothing else matters.” Rules to live by, indeed. There’s an exception to every rule. There is amazing, excellent contrafait to period music that is still relevant and fun to sing; and as we all know, there’s plenty of contrafait to modern music that misses its mark. Conversely, there’s a lot of modern stuff out there that does not make good filk. See my Filk Article for more on this. I have been feeling like I’m largely alone in the Laurel world regarding how we view and seek to foster the bardic arts in my Kingdom… For me, personally, I want someone to honor the tradition and the spirit of the role, but not sacrifice creativity in some slavish attempt to be “historically accurate”. The pressure we put on bards to be ÜBER HISTORICALLY ACCURATE is strangling a lot of natural talent and creativity and making it less fun for these folks to practice their passion. I am not a bardic laurel, but I started out in the SCA with a strong intent to be one (before I got horribly distracted by historical clothing). And now that I have the accolade, I have been turning back to music as a creative outlet, only to find that some of my closest friends who incredibly talented bards, are coming to me wanting me to explain why the Laurelate puts this insane amount of pressure on them to effectively get their Ph.D. in medieval music in order to be taken seriously. I didn’t feel that way when I was a candidate for historical costume–it was understood that while the research was integral to the process, the tools which I used to construct my clothing were negotiable. Not so with bardic, as you rightly pointed out. –Maestra Tullia da Ferrara, West. Thank you for giving so many so much to think about with what you have written here, and with all of your articles in this series.